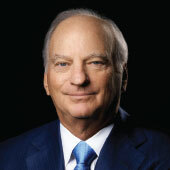 George Roberts founded Kohlberg Kravis Roberts & Co. (KKR) with his cousin, Henry Kravis, in 1976. Since then, the company has become a giant in the private equity industry. Graduating from Claremont McKenna College in 1966 with his B.A. in Art/Science, Roberts went on to earn his Doctor of Jurisprudence from the University of California (Hastings) law school in 1969. These days, George Roberts is listed as #104 on the Forbes 400 list. One of the most successful people in the world, Roberts is a self-made billionaire. And, he says, he only got there because he was willing to take a chance on forming KKR. “It seemed like a good idea at the time,” he said, reflecting back on the start of KKR. In a conversation with Stanford Business students, George Roberts urged them not to let opportunities pass them by, advice that seems to drive him both professionally and personally. George Roberts is also the founder and the Chairman of the board of directors of REDF, which is a nonprofit organization in San Francisco. The organization gives employment opportunities to those who are down on their luck and need it most, with the goal that those individuals and families will become self-sustaining and independent from government welfare. By offering financial assistance to individuals and families to get involved in social enterprises, they are allowing those enterprises to grow and flourish instead of hitting a barrier. And with growth, they can then offer further training and employment to others who are struggling.